BlackRadioIsBack.com Flashback Of The Day: Shalamar | BlackRadioIsBack.com - Official Blog of the Syndicated FuseBox Radio Broadcast! 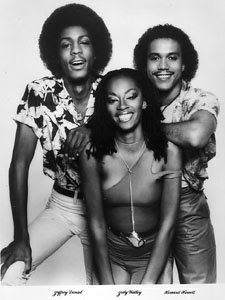 The great Soul Music group Shalamar consisted of vocalists Jody Watley, Jeffrey Daniel, and Howard Hewett (the latter replacing short-time member Gerald Brown) and formed officially in 1978. The group hooked up with legendary R&B producer Leon Sylvers III in 1979 and after signing with SOLAR Records, scored a major hit in the U.S. with "The Second Time Around" (Billboard #1 US R&B, #8 U.S. Pop). In the U.K., Shalamar had a string of hits with songs such as "Take That To The Bank" (1978), "I Owe You One" (1980) and "I Can Make You Feel Good", "A Night to Remember", "There It Is" and "Friends" (all in 1982). The Friends album (1982) was also a big release in the U.K. which crossed the genres of Pop, Disco and Soul music. Both Jody Watley and Jeffery Daniel left Shalamar over artistic arguments with the SOLAR record label, shortly after the release of the The Look album in 1983. While the album still did well in the U.S. and U.K. with a change in musical direction (more of a New Wave/Rock oriented direction) on point tracks like "Disappearing Act", "Dead Giveaway" and "Over And Over", it wasn't as big of a success as Friends. In the mid-1980s, there was a line-up change of new vocalists for the group, adding on Delisa Davis and Micki Free. Shalamar was still able to score some hits in that era with "Dancing In The Sheets" (from the Footloose movie soundtrack) and winning a Grammy for "Don't Get Stopped In Beverly Hills" from the Beverly Hills Cop movie soundtrack in 1985. When Howard Hewett left for a solo career in 1986, and was replaced by Sydney Justin, the band faded into obscurity. All of the original members came to have varying degrees of longterm success throughout the years as solo music artists. The most successful in the mainstream Soul Music world of the classic trio with their solo career was Jody Watley, who, with former Prince sidekick André Cymone, found success with her own albums and singles, which include "Looking For A New Love" (1987), "Friends" (1989; including the remix with legendary MCs Eric B. & Rakim) and "When A Man Loves A Woman" (1994). There also a Shalamar reunion with all 3 original members for the R&B singer Babyface's cover version of the Shalamar hit "For The Lover In You" with LL Cool J in 1996. Shalamar overall scored a total of three gold albums in America with Big Fun, Three For Love (which eventually went platinum over time) and Friends.